Mobile Pages replaced by Desktop Pages on Mobile Search - Something unusual this time! Since the start of February 2017, we have observed something unusual. 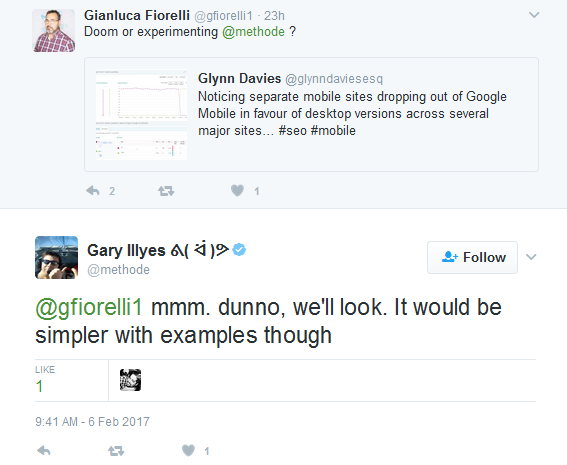 Some of the sites that have separate mobile version are seeing their mobile pages being replaced by desktop pages on Google Mobile search. This used to be a case earlier but not with such a big volume. I have faced few instances in the past where dedicated mobile version is perfectly set up with every thing in place, still we see desktop pages rank in mobile search instead of the mobile pages. The most probable reason for that was something already clarified by Google in 2015. 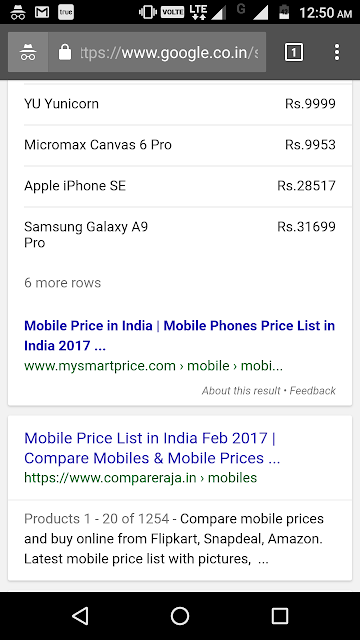 Google does not rank mobile content based on what is on the page served for mobile users, as the page is still ranked according to the content on the desktop page. The scenario will be the other way round when Mobile First Index is rolled out. Currently they actually run comparison checks on sites, comparing desktop versus mobile, to ensure that the content “matches up” when the site is using rel=canonical. There is a possibility that many a times, Google finds the desktop page more valuable than the mobile version and hence ranks desktop page on mobile search. But the scenario this month is a bit unusual. 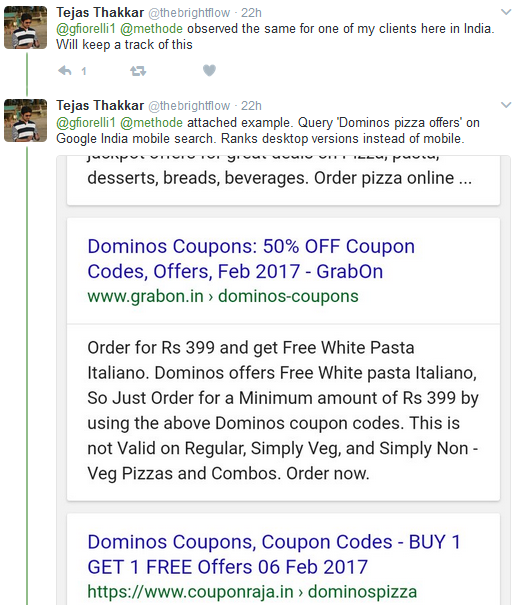 The above three screenshots were taken on 6th Feb 2017. 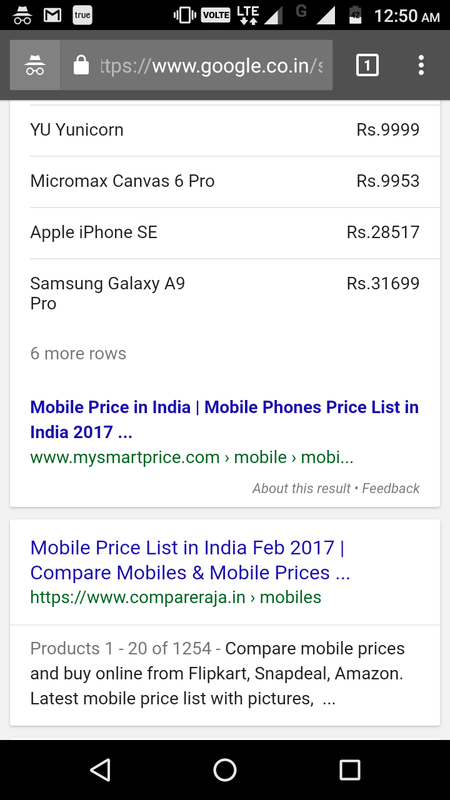 In the first screenshot, MySmartPrice and CompareRaja have separate mobile sites. 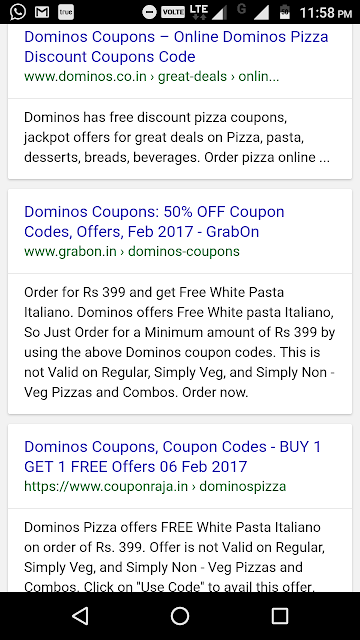 Usually they rank in mobile search results. But for some weird reasons, we can see the desktop versions ranking on mobile search. 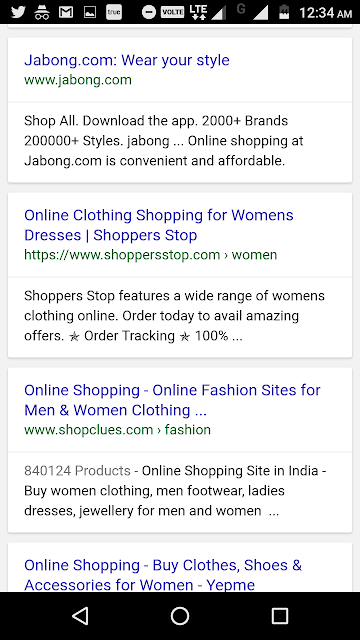 Similarly sites like GrabOn, Couponraja, Jabong and Shopclues also rank for their desktop versions instead of mobile pages as shown in the other two screenshots above. 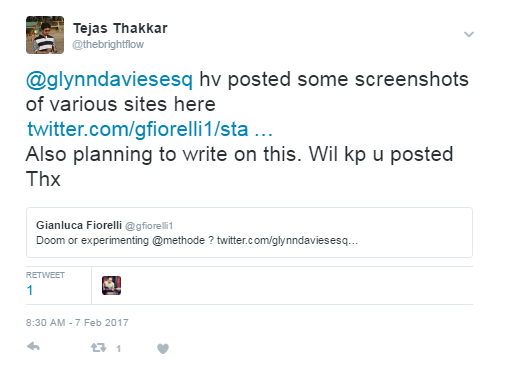 Neither Gary Illyes nor John Mueller has confirmed anything on this. Let's wait for their response. I also checked Google Search Console account for one of the sites that came across this issue. The impressions and clicks have gone up for the desktop version from 1st Feb 2017 and almost an equivalent drop is observed for the mobile version. Interesting. Let's see if this is an algorithmic experiment or merely a glitch. 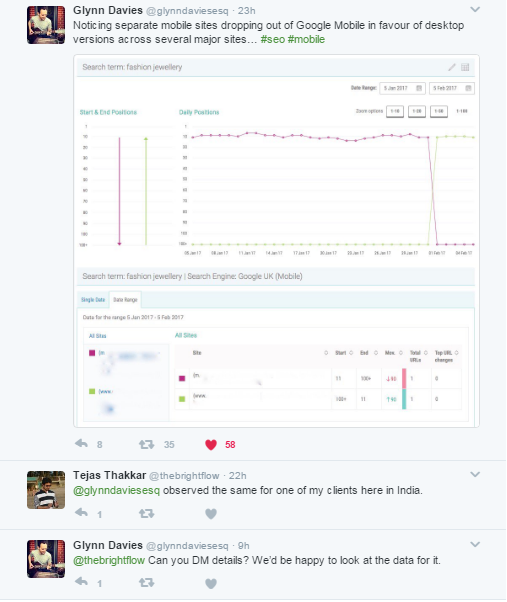 Please share your thoughts if you have seen a similar trend for your sites.